I layered nutmeg flavored ground beef & pork and cinnamon flavored Kabocha (Japanese squash). I used holly leaf cookie cutter for Christmas, but you can cut out any shape. This nice pumpkin color is perfect for Halloween and Thanksgiving, too!!! I hope this recipe will give you some ideas for your party menu!!! 1. Scoop out the seeds of Kabocha, wash (you don't have to drain well), place it on a microwavable dish, cover with plastic wrap, and microwave on medium (500W) for 3 minutes to make it easier to cut. Cut the Kabocha into large chunks (make sure you can cut out the skin with your cookie cutter later), cover with plastic wrap again, and microwave on medium (500w) for 5 minutes until tender. 2. Carefully scoop out the Kabocha flesh with a spoon. Mash the Kabocha using a fork while it is hot. Then cut out the skin with a holly leaf cookie cutter (or any cookie cutter of your choice). 3. Season the mashed Kabocha with A. 4. Heat 1/2 tbsp. olive oil in a frying pan. Saute the chopped garlic until fragrant. Add the chopped onion and saute on low heat until softened. 5. Add ground beef and pork mixture and cook until no longer pink. Season with B. Turn off the heat and let cool completely. Add egg white and mix well. 6. Preheat the oven to 220C (428F). Pour the meat mixture in the pie dish. Then pour the Kabocha sauce on top. Sprinkle with bread crumbs, grated parmesan cheese, and some olive oil. 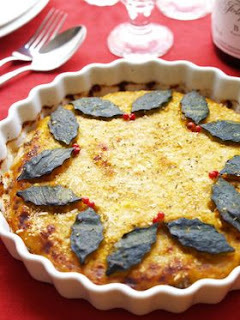 Then arrange the holly leaves made of Kabocha skin around the edge of the pie dish. 7. Cook in the oven at 220C (428F) for about 20 minutes until the top is golden. 8. Sprinkle with parsley flakes, and garnish with pink pepper (to resemble holly berries).